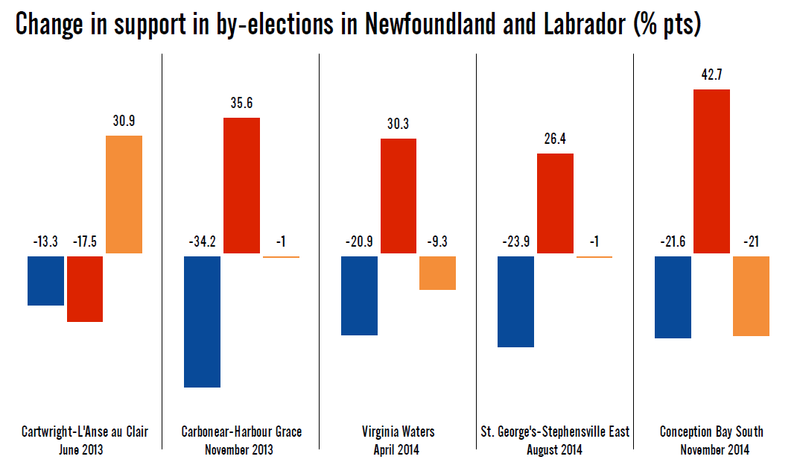 More dramatic swings in store in Newfoundland and Labrador? Two by-elections are being held today in Newfoundland and Labrador in the ridings of Trinity-Bay de Verde and Humber East. Both were won with massive margins by the governing Progressive Conservatives in 2011. So, of course, that means both could very well swing over to the Liberals tonight. Politics in Newfoundland and Labrador have been in a remarkable state of transition since Dwight Ball took over the Liberal Party in November 2013 and Kathy Dunderdale resigned in January 2014. The Liberals won only six seats in 2011, but after a series of floor-crossings and by-election victories their caucus has more than doubled to 14. The party has won five straight by-elections, including the last four in which the Tories were the incumbents. Their largest victory occurred just a few weeks ago, when they won the by-election in Conception Bay South by 1.8 points, after trailing by 62.5 points in 2011. No seat in Newfoundland and Labrador can thus be considered a safe one for the Tories. But will the party finally be able to break the Liberals' streak tonight? The chart above shows how support has shifted in the five by-elections that have been held since the 2011 general election. The first, in Cartwright-L'Anse au Clair, was held before Ball became party leader (the Liberals nevertheless held on). In every by-election since then, the Liberals have gained at least 26 points, picking up almost 43 in the by-election held in Conception Bay South. The Tories have lost between 21 and 34 points in each of the last four contests, while the NDP has lost either a little (one point in both Carbonear-Harbour Grace and St. George's-Stephensville East) or a lot (more than nine in Virginia Waters, 21 in Conception Bay South). On average, the Liberals have gained 23.5 points in by-elections held since the last general election, and 33.8 points in the four held since Ball took over the party. The PCs have shed 25.2 points on average over the last four contests, while the New Democrats have lost 8.1 points. This falls into line with what the polls have been saying. If we look at the last three polls in the province, done by three different firms between the end of July and October, we get the Liberals at 56% support, followed by the Tories at 29.2% and the NDP at 13.8%. Since the 2011 election, that represents a drop of 26.9 points for the PCs and 10.8 points for the NDP, with a gain of 36.9 points for the Liberals. Those shifts are almost identical to the average changes in support over the last four by-elections. If we look at it in terms of proportional changes, the Liberals have more than quadrupled their vote share in the last four by-elections. The New Democrats have retained just about two-thirds of theirs, while the PCs have retained only three out of every five voters who cast a ballot for their party in 2011. So what does that tell us about the by-elections being held tonight? 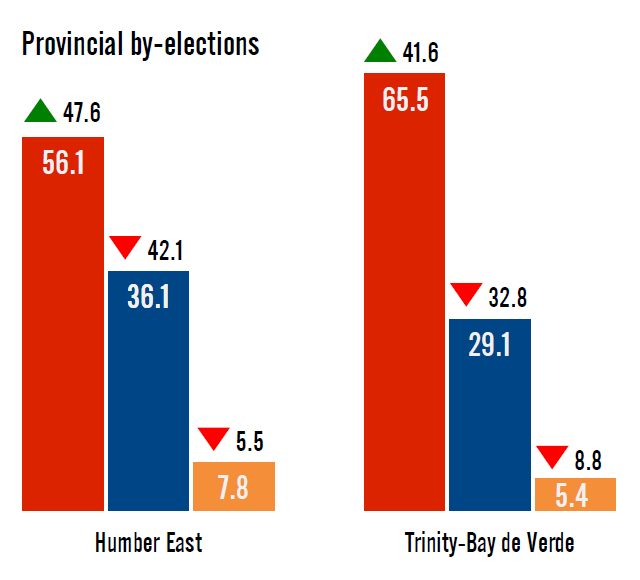 The By-Election Barometer considers Trinity-Bay de Verde a 'Strong Liberal' pick-up, while Humber East is a 'Likely PC' hold. Going by the past shifts we've seen in other by-elections, this seems reasonable. Trinity-Bay de Verde was won by the PCs with 61.9% of the vote in 2011, with the Liberals taking 23.9% and the NDP capturing 14.2%. The margin of 38 points between the PCs and Liberals is far smaller than the swings that have occurred in each of the last four by-elections (the smallest swing was 50.3 points in St. George's-Stephensville East, the largest was 69.8 points in Carbonear-Harbour Grace). The riding is thus well within striking distance of the Liberals. If the average point swing we've seen since Ball became Liberal leader occurs in Trinity-Bay de Verde, the party should take about 58% of the vote to 37% for the Tories (and 6% for the NDP). It would require a comparatively very poor performance by the Liberals to lose this one. But Humber East could be just outside of their grasp. The Tories took 78.2% of the vote here in 2011, with the NDP taking 13.3% and the Liberals just 8.5%. That puts the gap between the Liberals and the Tories at 69.7 points - just 0.1 percentage points less than the swing that occurred in Carbonear-Harbour Grace. The Liberals would need another massive swing of that size in order to wrestle the riding away. It might be too much to ask to repeat that performance. If the average swing occurs, the Tories would win it by 53% to 42% for the Liberals (and 5% for the NDP). Even if we apply the proportional swing, dropping the PCs by a factor of 0.6 and quadrupling the Liberal vote, they still come up short by 11 points. Winning Humber East will be a tall order for the Liberals, but they have shown they are capable of such enormous swings before in Carbonear-Harbour Grace. With the shifts we've seen in Newfoundland and Labrador, even a riding like Humber East could flip. Tom Marshall, who held the riding for the Tories since 2003, was a popular MHA and the riding was won by the Liberals when they were last in government. Despite what the numbers say about the likelihood of Humber East going over to the Liberals, they nevertheless have a shot at it. And that just about sums up how bad things are for the Progressive Conservatives in Newfoundland and Labrador. Yesterday was a good day for the New Democrats in Quebec. Maria Mourani, a former Bloc MP, announced that she was joining the NDP (at least on the membership rolls, if not in caucus) and a new poll published by La Presse put the party and Thomas Mulcair in front in the province. But is this part of a positive trend for the NDP leader, or just another wobble back and forth? CROP was last in the field on October 16-20. Since that poll, the NDP has picked up four points to move into the lead in Quebec with 34% support. The Liberals dropped five points, the only shift outside the margin of error of similarly sized probabilistic samples, to 32%. The Conservatives placed third in the poll, up one point to 16%, putting the Bloc Québécois in fourth with 14% (unchanged). The Greens had 4% support. Of the entire sample, 10% was undecided and another 5% would not vote or did not respond to this question. 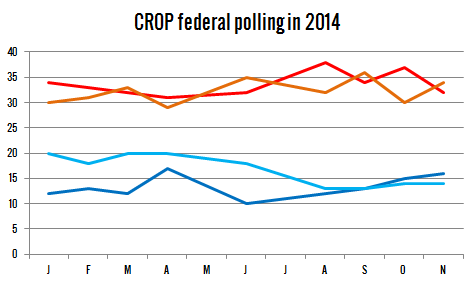 Note that support for Others (which would include Forces et Démocratie) was at 0%, as it always is in CROP's polling. Is this slip by the Liberals a sign of trouble for the party? That is always a possibility, of course, but in CROP's polling we've seen the Liberals and NDP trade the lead back and forth for all of 2014. There is little discernible trend in these numbers. The Liberals and NDP have been neck-and-neck throughout the year. But CROP did record the same sort of bump for the Liberals in the summer that other polls did, so it would seem that the party may be coming off that high to more usual levels of support. A negative trend for the Bloc Québécois after Mario Beaulieu became leader in June, however, is readily apparent. The Conservatives are on the upswing, but that is from a very low point. They are still generally were they have been in the province since the last election. The New Democrats increased their lead among election-deciding francophones, stretching it to 12 points with 39% support to 27% for the Liberals. The party has not trailed among francophones in any poll since February. The Bloc was at 17%, while the Conservatives were at 13%. Among non-francophones, the Liberals tumbled 17 points to 49%, the lowest score they have managed among this group since before Justin Trudeau took over the party. The sample size is small, however, and would normally carry a margin of error of about eight points. Nevertheless, it may be something to keep an eye on. The Conservatives were up to 29% among non-francophones, which might potentially put them in the running in a riding or two on the West Island. The NDP was third with 17%, followed by the Greens at 5% support. The New Democrats were ahead on the island of Montreal as a whole with 42%, followed by the Liberals, who were down 15 points to 25%. 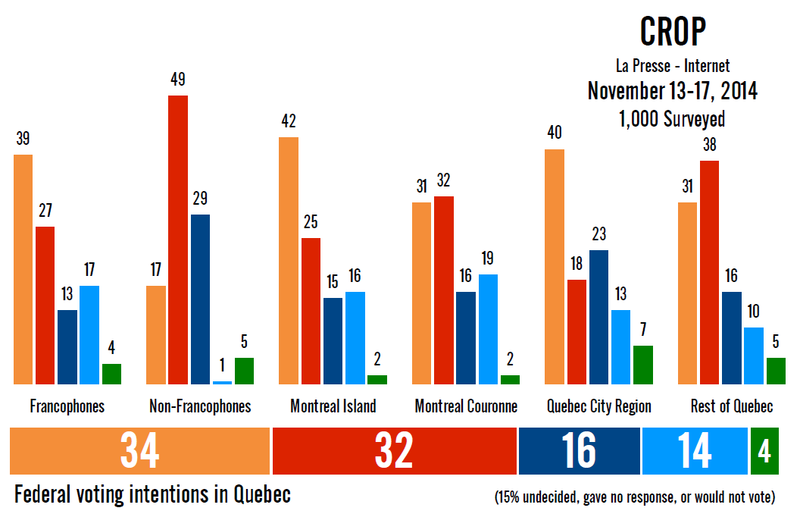 The Bloc was at 16% and the Conservatives at 15% (coupled with their strong non-francophone numbers, this suggests they are doing very badly among island-dwelling francophones). Off the island of Montreal but within the metropolitan region, the Liberals were narrowly ahead with 32% to 31% for the NDP. The Bloc had 19% support here, its highest in Quebec, while the Conservatives were up seven points to 16%. In and around Quebec City, the NDP was in front with 40% support, followed by the Conservatives at 23% (their lowest since the spring) and the Liberals at 18% (their lowest since February 2013). The Bloc had 13% support in the provincial capital. And in the rest of Quebec, the Liberals were ahead with 38% support to 31% for the NDP, 16% for the Conservatives, and just 10% for the Bloc Québécois. Considering the 'RoQ' is where all of the Bloc's current or former MPs were elected (save Mourani) in 2011, that spells a lot of trouble for the party. Indeed, with these numbers the Bloc would be shut out entirely. The New Democrats would ride their advantage among francophones to around 49 seats, with the Liberals capturing 21 and the Conservatives taking eight. It makes for a good poll for the NDP. 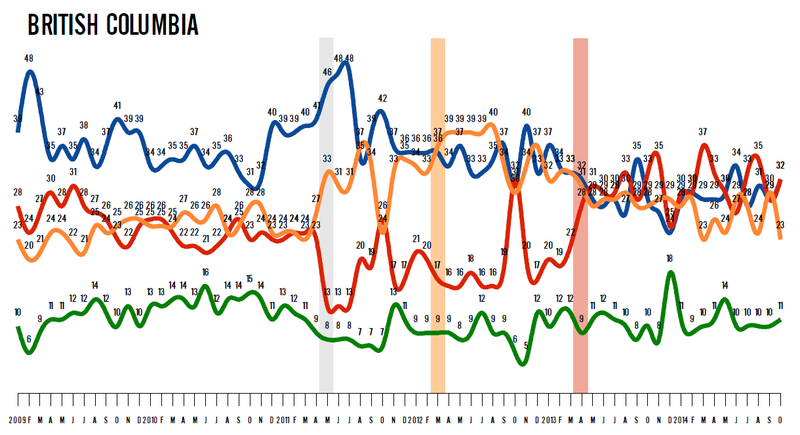 Mulcair was ahead on who Quebecers preferred for Prime Minister with 29%, a gain of seven points since last month. Trudeau was down six points to 22%, while Stephen Harper had 13% support. As these numbers do not exclude undecideds or people who say 'none of the above', we can say that Mulcair and Harper appear to be about as popular as their own parties. Trudeau, however, scored five points lower than the Liberals before undecideds were excluded. One interesting tidbit from the CROP poll was the breakdown of federal support by who Quebecers support at the provincial level. With these numbers, we see that Philippe Couillard's Liberal supporters primarily intend to vote for the federal Liberals (48%) and the Conservatives (31%). The Parti Québécois's supporters are split between the Bloc (44%) and the NDP (31%), while supporters of the Coalition Avenir Québec would vote for either the NDP (45%) or the Liberals (30%). That the Bloc cannot even draw a majority of PQ voters to its banner is another nail in its coffin. But we can also reverse these numbers to see where each of the federal parties draw their support from. Quebecers who vote for the Bloc Québécois are primarily PQ supporters (about 70% by my own calculations), with a smattering of CAQ voters (14%). That makes for a rather simple coalition of nationalists. The Liberals and Conservatives are a little less monochromatic. About 57% of the federal Liberals' base comes from the provincial Liberals, while another 25% comes from the CAQ. But these two parties generally see eye-to-eye on things (the CAQ has even accused the PLQ of borrowing liberally from its platform). The Conservatives have a similar breakdown, 66% of their voters being supporters of the PLQ and 19% of the CAQ. The New Democrats have a much trickier coalition to keep together. Their largest block of supporters are drawn from the CAQ, at 35%. The PQ and Québec Solidaire each provide about 21% of the NDP's support base, while 19% are provincial Liberals. There are many ways to divvy these NDP voters up. On the national divide, about 42% of them are sovereigntists (PQ+QS) and 77% of them are nationalist (adding the CAQ to that total). Put another way, 54% are federalist (CAQ+PLQ). The sovereigntist/federalist split also aligns with how the party's supporters are divided between centre-right and centre-left. This makes for a potentially divisive coalition of voters. It is obvious why QS would support the NDP (the party has always been more of a left-wing party than it is a sovereigntist one), and the PQ and NDP have similar social democratic roots. But the NDP is also federalist, so that makes them an option for centre-left provincial Liberals, while the party is somewhat populist and an 'alternative' to the traditional two party system, which might attract CAQ voters. On the other hand, that the NDP is federalist could push QS and PQ voters away in the spotlight of an election campaign, while it is further from the CAQ and PLQ on the left-right spectrum than either the Conservatives or the federal Liberals. It makes for a difficult balancing act for Thomas Mulcair. But he seems to be mostly pulling it off. The old sovereigntist/federalist divide in Quebec is fading away, as voters move from one party to another. And even the left/right politics of the province are being turned on its head, as labour-busting Pierre-Karl Péladeau emerges as the saviour of the centre-left PQ. It makes for a complicated political landscape in the province. Perhaps that is why Mulcair, a veteran of the provincial scene, has managed it. So far. Will Conservatives drop, Liberals gain in Monday's by-elections? Update on Election Night: Answer? Yes. The Conservatives took a hit in their vote share more or less in line with how they have performed in past by-elections, but nevertheless put up some decent and respectable results with (at time of writing, with still some votes to be counted) 63% in Yellowhead and 49% in Whitby-Oshawa. They also won both ridings, which in first-past-the-post is all that matters. The Liberals had a good night in terms of vote share increase, jumping to 41% in Whitby-Oshawa (almost tripling their share) and 20% in Yellowhead (increasing it more than sixfold). But they still came up short. The Liberals will do well in 2015 if they can replicate these kinds of swings, but will not go very far if they just replicate these close losses instead. 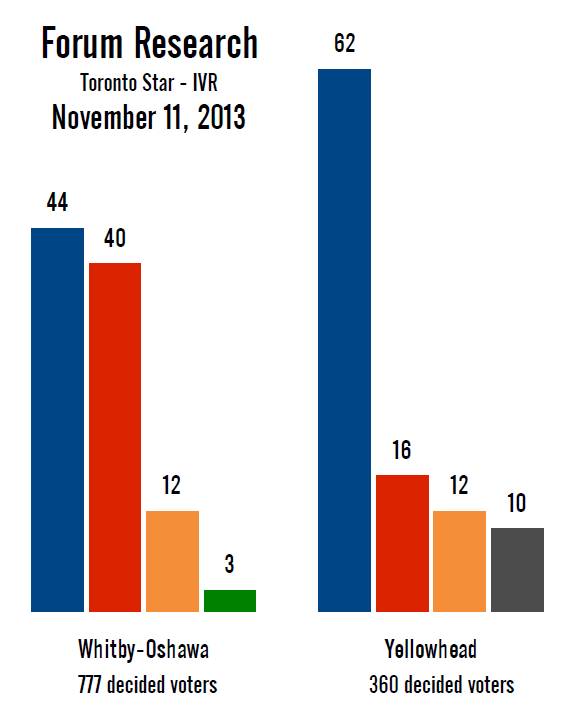 The New Democrats had a bad night in Whitby-Oshawa, dropping to just 8%. They held their own in Yellowhead, however, with 10%. But the party's future prosperity lies not in rural Alberta, but in seat-rich Ontario. The drop of more than half of their vote share in Whitby-Oshawa is not a promising sign. But these are still just by-elections, when a two-horse race can have a stronger influence on strategic voting than might be the case in a general election. Nevertheless, little silver lining to be had for the NDP. In terms of the polls, Forum should have quit when it was ahead. The polls of November 11 that I wrote about below were quite close, but their election eve polling of November 16 was worse. And in the case of Yellowhead, much worse. The Conservatives have put up poor results in byelections since winning a majority government in 2011, and will again be put to the test in two contests in Ontario and Alberta on Monday. Will they be able to hold on to their two seats? You can read the rest of the piece on CBC.ca. It goes over some of the regional-level polling Alberta and Ontario, the by-election record of the major parties since 2011, and how the Conservative government's record stacks up. Let's briefly here go over the by-election polls that were out this morning. They were conducted by Forum Research, and we all know how hit or miss their by-election polling has been in the past. One thing to take into consideration, however, is that Forum's by-election record is actually not too bad in the GTA, where the Whitby-Oshawa by-election is being held. Their notable misses took place in Alberta, Manitoba, and elsewhere in Ontario. We'll see if that trend continues on Monday. Forum now has it as a close race in Whitby-Oshawa, with Pat Perkins of the Conservatives at 44% and Celina Caesar-Chavannes at 40%. That represents a narrowing of the gap, as Perkins does pick up three points while Caesar-Chavannes picks up eight compared to Forum's poll of October 27. The NDP's Trish McAulife is down three points to 12%. That it has become a close race is a little bit of a surprise. The Flaherty legacy is strong in the riding. So, we should take these results with a little caution. When Forum has been off in the past, often it was an over-estimation of the challenger's support. So that would suggest Perkins has more of an edge than the poll indicates. In Yellowhead, we get our first poll of the campaign. Jim Eglinski of the Conservatives was well ahead with 62%, followed by 16% for the Liberals and 12% for the NDP. These are intuitive numbers at the very least. Unless Whitby-Oshawa flips, the thing I will be looking for on Monday is whether the Conservatives continue to take a significant hit in these by-elections to the benefit of the Liberals, continuing to corroborate what the polls are showing to be the case at a wider level. 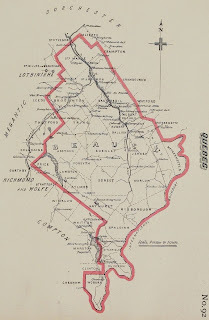 Tucked away in a corner of Quebec along the American border, the riding of Beauce has not changed much since it was created in 1867. And for six decades between 1887 and 1949, it never voted anything but Liberal. But since then, Beauce has been a bit of a rainbow riding, having been represented by Liberals, Conservatives, Progressive Conservatives, Social Credit, and Independents. Today, it is one of the few safe ridings the Conservatives still have in Quebec. This is the fourth riding the history of which I am profiling as part of the 2013 Kickstarter campaign. This riding was requested by backer Thomas Barré, who generously contributed to the project that led to Tapping into the Pulse: Political public opinion polling in Canada, 2013. The ebook can be ordered here, or directly from Gumroad here, Amazon for your Kindle here, or from Kobo here. Beauce's first Member of Parliament was a Liberal, Christian Henry Pozer, who defeated a man named Taschereau by 1,180 votes to 629. Pozer was from the region and a lawyer, and he simultaneously represented the provincial riding of Beauce for the Liberals until 1874. Pozer was not a very active member of the House of Commons. The first recorded statement he made (apart from reporting on the findings of a committee investigating a case of alleged electoral fraud in the riding of St. Hyacinthe, and having another MP ask a question for him in his absence) came only in April 1869, almost two years after he was first elected. But he was no wilting flower, apparently, as the statement came when he contradicted something the Premier of Quebec, Pierre-Joseph-Olivier Chauveau, had said. Chauveau, like Pozer, was also a member of Quebec's National Assembly. In a debate, another MP was saying that some "members might find it a good thing in a pecuniary point of view to attend both Legislatures, and draw indemnities from the Local as well as the General Governments." The member then charged that Chauveau had said in Quebec City that it was within the federal government's jurisdiction to rule on this question. Chauveau disputed this. But then Pozer spoke up - seemingly for the first time as an MP: "Mr. Pozer was a member of the Legislature of Quebec, and said that if his memory failed not, the hon. gentleman had stated that the Local Legislature could not decide the point, as the Federal Parliament was the proper tribunal." Chauveau's response? A single word: "Jamais." Pozer was re-elected in 1872 with a larger majority, and in 1874 no one bothered to oppose him. He was then named to the Senate, where he would sit until his death in 1884. With Pozer gone, the Conservatives took the riding. Joseph Bolduc won it in a close race, defeating De Lery, a man whose affiliation history records as unknown. Bolduc was just 29 years old at the time, a volunteer in the militia and mayor of St-Victor-de-Tring. Bolduc's hold on the riding solidified in 1878, when he won it with 79% of the vote. He was re-elected again in 1882. He did not run again in 1884, as he was also named to the Senate, where he would be the Speaker from 1916 to 1922. In all, Bolduc would serve for 48 years in the House of Commons and Senate. His replacement was Thomas Linière Taschereau, a lawyer and, at 34 years of age, another young man. But Taschereau would not run for re-election in 1887 (though he would get the itch again, and fail, in 1896 and 1900 in the riding of Kamouraska). Instead the riding swung back to the Liberals in 1887, or at least 'Independent Liberal' Joseph Godbout (he would later run as a Liberal). Godbout was a physician, and would be re-elected three more times. Beauce got itself another senator when Godbout was named to the upper chamber, where he would sit until 1923. He was replaced by Henri-Sévérin Beland, another physician, who was acclaimed in 1902. Beland had been the provincial Liberal MNA for Beauce, and was the mayor of St-Joseph-de-Beauce from 1887 to 1899. Beland would dominate the riding for the next 20 years. He won it in 1904 with 73% of the vote and again in 1908 with an astounding 96% of ballots cast. After winning again in 1911, he was named Postmaster General. When war broke out, he went overseas and 'served with the Belgian surgical hospital staff'. His work was cut short when he was captured by the Germans, and he would be a prisoner-of-war for three years. He wrote a book about it. He was acclaimed in 1917 (one assumes he was re-elected while a POW) and, after winning 90% of the vote in 1921, was named the Minister of Soldiers' Civil Re-Establishment and Minister presiding over the Department of Health. 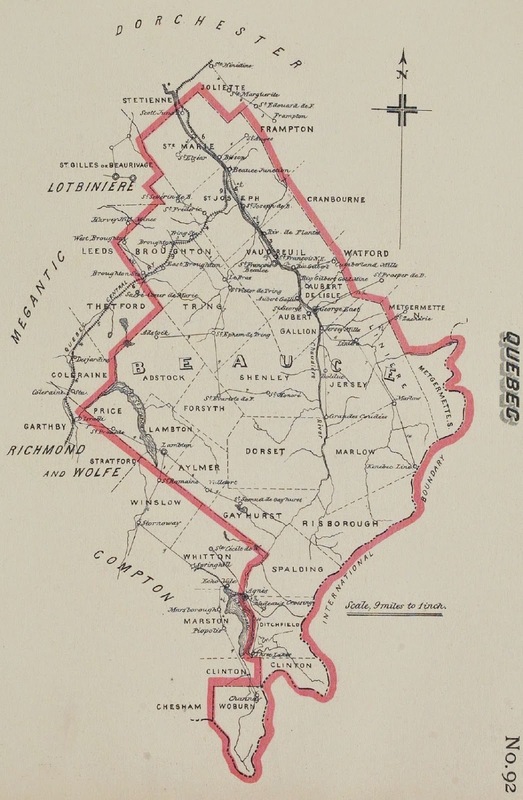 In 1925, Beland would follow in the footsteps of past Beaucerons, and was named to the Senate. He sat there for 10 years. Édouard Lacroix, a lumber merchant, won the 1925 vote for the Liberals with 78%, hardly missing a beat after Beland's massive majorities. He would take 81% of the vote in 1926, 65% in 1930, and 89% in 1935 against a Reconstruction candidate. He won again in 1940, but crossed the floor in 1943 to sit with the Bloc populaire canadien, a French Canadian nationalist party. He resigned his seat in 1944 to enter provincial politics, representing the party at the provincial level until 1945. Lacroix was the grandfather of Robert Dutil, who is a current Liberal MNA. With Édouard off the ballot in 1945, his brother Charles tried to hold the riding as an independent, but was defeated by Liberal Ludger Dionne, mayor of St-Georges from 1934 to 1942. The 1945 election would be notable in Beauce for the first candidacy of Social Credit, which took 25% of the vote. Dionne was defeated in 1949 in a close election, as Raoul Poulin took it with 46% to Dionne's 45% (a Union of Electors candidate took 8%). Poulin was another physician and an independent, but had previously represented the riding for Union Nationale at the provincial level and had also sought election as a provincial Conservative. Poulin was re-elected twice, first against another Poulin in 1953 (Louis, a Liberal) and again in 1957 against Dionne. One assumes that with Poulin's provincial conservative background, the PCs at the time did not bother to put up a candidate of their own. This is seemingly confirmed by Poulin's defeat in 1958, when a PC candidate took 17% of the vote and Jean-Paul Racine of the Liberals won with 42% to Poulin's 41%. Racine, mayor of St-Honoré from 1955 to 1957, did not last long, losing in 1962. He lost to Gérard Perron, a hotelier and candidate for Social Credit. He took 59% of the vote, winning a majority again (and again against Racine) in 1963. Racine returned to office in 1965, when Perron was defeated in part, it would seem, by the candidacy of Robert Cliche. Associate President of the federal NDP who was named leader of the Quebec NDP in 1965, Cliche took 29% of the vote in a three-way race with Perron (28%) and Racine (41%). Cliche would later improve his share to 44% when he ran in 1968 in Duvernay, but again he fell short. In Beauce, Ralliement créditiste (as Social Credit was then known in Quebec after a split) returned in 1968 under Romuald Rodrigue, an accountant. Rodrigue took 48% of the vote, but was defeated in 1972 when Yves Caron of the Liberals narrowly edged him out. Caron defeated Rodrigue again in 1974, and was named Parliamentary Secretary to the Minister of Agriculture in 1977. In 1979, however, Caron lost as Pierre Trudeau's Liberals were booted from office nationwide. Instead, Fabien Roy won the riding for Social Credit with 57% of the vote. Roy was the party's leader, and had previously represented the provincial wing in the National Assembly from 1970 to 1975 (he then was part of an off-shoot party called the Parti national populaire until 1979). Though Roy would hold Social Credit's leadership for just a year, he made a mark on Canadian political history by abstaining from the vote of confidence that led to the defeat of Joe Clark's government in 1980. But Roy was also defeated that year, as Normand Lapointe of the Liberals took the riding back. Lapointe was an insurance agent, and was named Parliamentary Secretary to the Minister of Labour in 1983. Lapointe was swept away by the PC tide in 1984, and Gilles Bernier, a popular radio personality, won the riding for the Tories with 53% of the vote. He won it again in 1988 with 69%. But in 1993, Bernier was facing fraud charges (he was acquitted) and so could not run under the PC banner. He instead ran as an independent, winning 41% of the vote against just 8% for the PC candidate. The Bloc Québécois, with 36%, came the closest it has ever come to winning the riding that year. Bernier was named ambassador to Haiti in 1997 (he would serve until 2001), and so the riding was up for grabs in 1997. It was won by Claude Drouin, formerly of the air force and a political advisor, with 49% of the vote. Drouin was re-elected in 2000 and 2004, and would serve as Parliamentary Secretary to the Minister of Industry, Secretary of State (Economic Development Agency of Canada for the Regions of Quebec) and Parliamentary Secretary to the Prime Minister (Rural Communities) over that time. Drouin did not run again in 2006, and this opened the door for Maxime Bernier, son of Gilles Bernier. A lawyer and businessman and locally popular due to his family ties, Bernier took 67% of the vote in a landslide win (his was the best performance of any Conservative outside of Alberta). The Bloc finished second with 20%. Bernier was named to cabinet as Minister of Industry in 2006, and was promoted to Minister of Foreign Affairs (and responsible for La Francophonie) in 2007. His career at cabinet was short-lived, however, as he resigned in 2008 after a scandal related to his relationship with Julie Couillard, who had past romantic links to the Hell's Angels. Bernier also left some classified documents at her house. Nevertheless, Bernier was re-elected in 2008 with 62% of the vote. The Bloc took just 14%. Bernier would be re-elected again in 2011, this time with 51%, as the New Democrats surged to second place with 30% support. The Bloc fell to fourth. Bernier returned to some favour within the government, and was named Minister of State (Small Business and Tourism) in 2011, with Agriculture being added to his portfolio in 2013. Beauce is an interesting riding in Quebec, being one of the few in the province that has had a strong conservative/populist bent over the last few decades (since 1962, the Tories have won six times, if we include Gilles Bernier's 1993 win, the Liberals seven, and Social Credit four times). Bernier and the Conservatives remain favoured there. But Beauce is no stranger to significant swings in support. Whether or not the Conservative edge will last beyond Bernier remains to be seen. It was an eventful month in Ottawa, with the vote on the Iraq mission and the shootings on Parliament Hill both taking place. Four national polls and two regional surveys (one in Alberta, the other in Quebec) interviewed a total of just over 7,600 Canadians, finding that the Liberal lead has slipped a little. Nevertheless, that lead has now held for 19 consecutive months. The Liberals averaged 35.6% support in October, down 2.4 points from their standing in September. That represents three consecutive months of softening support, though they still remain above where they were in the spring. The Conservatives were down 0.4 points to 29.5%, while the New Democrats were up 0.3 points to 22.5%. That is their best result since June. The Greens increased by 1.7 points to 6.4%, while the Bloc Québécois was at 4.2% and support for other parties averaged 1.8%. The Liberals picked up 2.4 points in British Columbia to move into a narrow lead with 31.8%, followed by the Conservatives. They were up 2.2 points to 31.5%. The New Democrats fell to their lowest level of support since March, slipping seven points to 23.1%. The Greens, meanwhile, were at their best since May with a gain of 0.8 points to 11.2%. In Alberta, the Conservatives were down 4.7 points to 50.1%, their worst performance since May. The Liberals were down 2.5 points to 24.7%, while the New Democrats were up one point to 11.6%. At 9.9%, a gain of 5.1 points, the Greens put up their best results since December 2013. The Conservatives hardly budged in the Prairies, where they were down 0.1 point to 39.3%. The Liberals have also been very steady, registering between 29% and 33% support over the last 11 months. They were down 1.2 points in October to 31.2%. The NDP was up 0.2 points to 24.2%, while the Greens increased by 1.2 points to 4.2%. In Ontario, the Liberals dropped 2.7 points to 40.4%, their lowest level of support since June. The Conservatives were up 1.1 points to 34.2%, while the NDP was also up, by 1.4 points to 19.6%. The Greens increased by 0.6 points to 4.9% support. The Liberals slid 3.7 points in Quebec to 32.9%, putting them just ahead of the New Democrats. 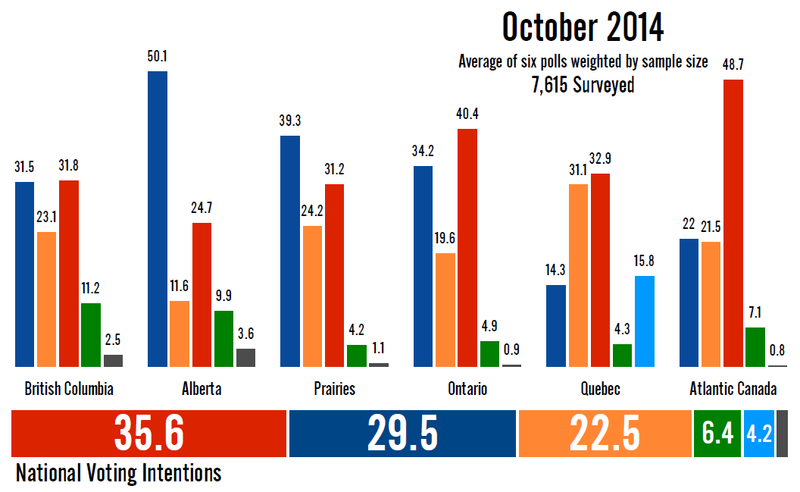 The NDP has gained for three consecutive months now, up 1.1 points since September to 31.1%. The Bloc Québécois was up 0.3 points to 15.8% (they have been around 16% for the last three months), while the Conservatives were also up 0.3 points to 14.3%. The Tories have been at 14% in seven of the last eight months. The Greens were up 1.2 points to 4.3%. Support for other parties, which is unlikely to include Forces et Démocratie as only one of the five polls conducted in Quebec were done after its launch, increased from 0.8% to 1.5%. And in Atlantic Canada, the Liberals dropped 0.4 points to 48.7%, followed by the Conservatives at 22% (+0.2), the New Democrats at 21.5% (-1.2), and the Greens at 7.1% (+2.0). With these levels of support, the Liberals would likely win about 136 seats, a drop of seven since September's projection. The Conservatives were up 10 seats to 122, while the NDP was down four seats to 77. The Liberals gained three seats in British Columbia, but were down one in the north, three in Quebec, and six in Ontario. The Conservatives were up five seats each in British Columbia and Ontario. They held steady everywhere else. The New Democrats were down eight seats in B.C. but were up one each in the north and Ontario, and two in Quebec. The Greens remained at two seats in British Columbia, while the Bloc moved from being shutout in Quebec to holding one single seat. Overall, it was a relatively stable month with most shifts at the regional level being below 2.5 points. Even the Liberal drop nationwide could be anomalous. The decrease recorded by Abacus Data in October has already been mostly erased in a November survey, and EKOS's shift in Liberal support might have been due to a change in methodology. But Forum also showed a slip, so perhaps it was something real that may, or may not, be made good in November. We'll have to see what other surveys turn up in the coming weeks. As yet, though, no one party seems to have taken particular advantage. With the two largest opposition parties in Canada's two largest provinces looking for new leaders, it is time to launch ThreeHundredEight.com's leadership endorsement rankings. As the contests just get going, Christine Elliott and Bernard Drainville start as the leaders in the Ontario PC and Parti Québécois leadership races. Long-time readers may remember the leadership endorsement system, which was employed with some success to gauge the 2011 Bloc Québécois, 2012 Liberal, and 2013 NDP leadership races. The system uses endorsements to try to estimate the support each candidate has within the 'establishment' of the party they are trying to lead. Each endorsement is given a value based on the endorser's importance within the party. Though it is not necessarily a real gauge of support in a leadership race, past contests have shown that 'establishment' support is a decent proxy for membership support. A full explanation of how the system works can be found here, where the tables and charts for the PC and PQ leadership races will be maintained. How has the system worked in the past? It was developed by trying to reverse-forecast a series of races, with points being awarded in a way that would get a close estimate to the final result. When it was first deployed in the 2011 BQ race, the system correctly pegged Daniel Paillé to be the eventual winner. In the 2012 NDP race, it accurately put Thomas Mulcair and Brian Topp as the two front-runners, giving Mulcair 29% of the endorsement points (he got 30% support on the first ballot). The system's best performance was in the 2013 Liberal leadership race. Justin Trudeau was awarded 82% of the provincially-weighted endorsement points (to match the system being used to elect the party's new leader), and in the end received 80% of the points. Joyce Murray was given 8% of the endorsement points, and took 10% of the vote. Martha Hall Findlay was given 10% of the points and took 6% of the vote. In provincial races, when the system was applied, it accurately picked Dwight Ball to beat Paul Antle in the Newfoundland and Labrador Liberal race. Philippe Couillard was correctly identified as the eventual winner of the Quebec Liberal race, and the system also put Raymond Bachand and Pierre Moreau in a near-tie, as actually happened. And if I had applied the system to the recent Alberta NDP race, it would have gotten Rachel Notley's share of the vote almost exactly right. So, let's get to the endorsement rankings, starting with the Ontario Progressive Conservatives. Elliott starts as the favourite to win within the PC establishment, with 47.3% of the currently available endorsement points. She has, by far, the largest number of endorsers and has wide support within caucus (in addition to herself, seven caucus members are backing her). She also has the support of a few Conservative MPs and former MPPs. The only other candidate with a good number of endorsements is Lisa MacLeod, who comes second with 32.5% of the endorsement points. She has four caucus members supporting her, including long-time MPPs Garfield Dunlop and Julia Munro. After these two, there is a clear second tier. Monte McNaughton is narrowly in third in the endorsement rankings with 8.6%, thanks to the support of caucus member Bob Bailey, as well as a former MPP. Patrick Brown, with 8.2% of the points, gets most of his support from Ottawa. He has the support of four fellow MPs, more than Elliott's three. He has one caucus member, Rick Nicholls, in his camp. 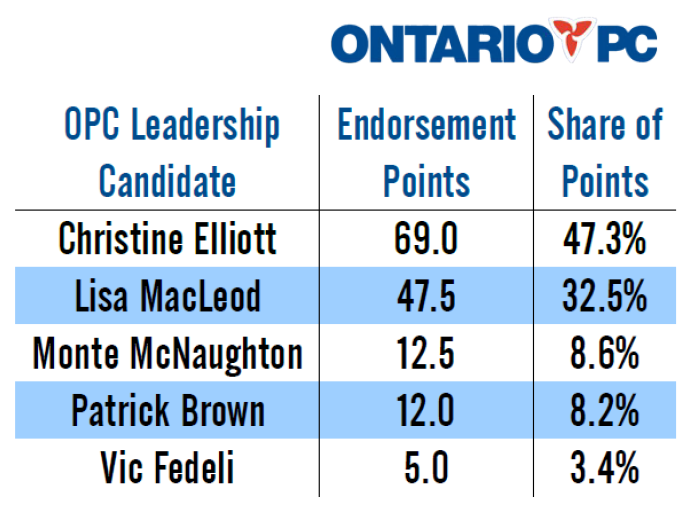 Rounding out the list is Vic Fedeli, who currently has no endorsements but has 3.4% of the points due to the points he himself brings to the table. This seems intuitive. Elliott is widely seen as the frontrunner, and a recent Forum Research poll suggested a plurality of Ontarians think she'll win. The wildcard in this race will be Doug Ford, if he chooses to enter. I imagine he could get a lot of support from the membership without acquiring many endorsements. Now to the leadership race to take over the Parti Québécois. Here again, a political heavyweight has yet to throw his hat in the ring. 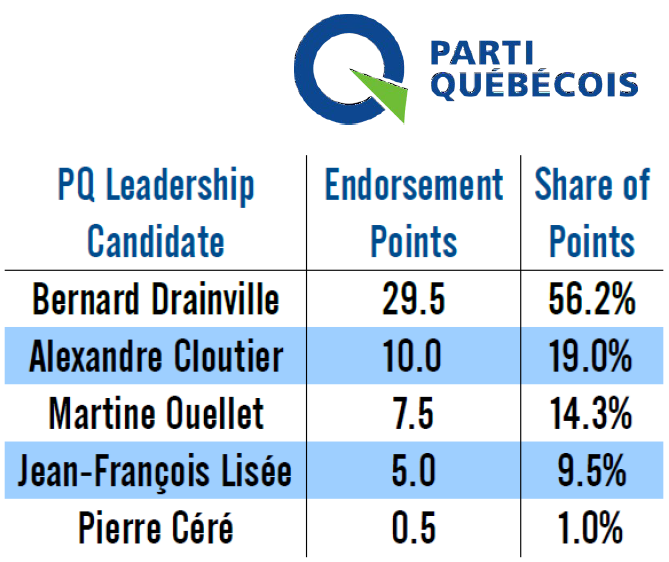 But of those who are in the race, Drainville is well ahead. He has 56.2% of the currently available endorsement points. He is the only candidate currently to boast any endorsements from within caucus. He has three, as well as the support of a former MNA. After him are Alexandre Cloutier, Martine Ouellet, and Jean-François Lisée. All three of them only have as many points as their own 'value' gives them. It will be interesting to see which of the three can land some endorsements in the early stages of the race. The last is Pierre Céré, who is not a sitting PQ MNA (nor has he ever been one). He does have the support of a former BQ MP, Yves Lessard, so he is on the board. The big question is, of course, Pierre-Karl Péladeau. A bid for the leadership seems inevitable, and he already has three MNAs who would support him if he runs. That gives him a total of 30 points, meaning he would be narrowly in front of Drainville with 36.4% to 35.7%. It seems only a matter of time before Péladeau tops the list. Both of these races will come to a close in May, so there is still plenty of road ahead of us. I will be updating the rankings every Wednesday, though I may not always post about them on the front page. Follow this section of the site for all the latest numbers. 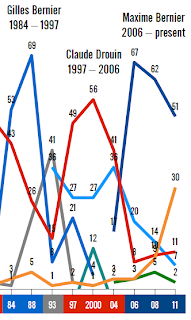 Which party is at most risk from Forces et Démocratie? Two weeks ago, Jean-François Fortin launched Forces et Démocratie, his new political vehicle. The party is a Quebec-focused regional party, dedicated to giving its MPs more independence to represent their region's interests in the House of Commons. He was able to convince Jean-François Larose, an NDP MP, to cross the floor to sit with him. Due to Fortin's past as an MP for the Bloc Québécois, one might assume that FeD is poised to eat further into the Bloc's support. But FeD is trying to straddle the line between sovereigntist and federalist, much like the Coalition Avenir Québec at the provincial level, by avoiding the issue entirely. This has the potential to make FeD the kind of party a lot of Quebecers felt the Bloc was when it was dominant - one that could represent the views of Quebecers who were disconnected from the federal system. But by not being a sovereigntist party, FeD could potentially rob votes from the federalist parties that have stepped into the gap opened up by the downfall of the Bloc. Are any of the parties at particular risk? We'll start with awarding FeD just 5% of the vote, taken directly from each of the parties. There is reason why FeD could be an attractive option to supporters of other political organizations. 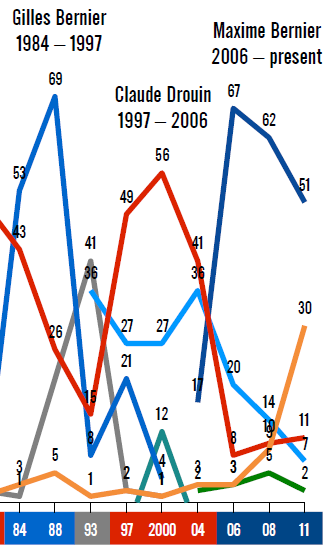 Giving more power to MPs is popular across the board. As a regionalist party, individual candidates could take a more centrist or even centre-right approach, pick-pocketing from the Conservatives. As a new party, FeD could be an attractive option to voters charmed by the novelty of the Justin Trudeau-led Liberals. As a voice for francophone Quebecers, FeD could be a vehicle for Quebecers who voted NDP but are not keen on pan-Canadian parties. And as a defender of Quebec's interests first and foremost, it is a natural heir to the Bloc. Based on the current polling averages, the NDP would likely win around 46 seats in Quebec with 31.1% of the vote, with the Liberals taking 23 seats with 31.6% of the vote. The Conservatives, at 13.4%, would win seven seats, while the Bloc could win two with 17.1%. If FeD captures 5% of the vote, it will only play a very minor spoiler role. By reducing the Conservatives to just 8.4%, they would be the most impacted, dropping to just two seats. The Liberals would hardly take a dent, slipping two seats to 21. This is an indication of how the Liberals' vote is unlikely to be concentrated in the outlying regions of the province. The New Democrats would drop four seats, proportionally a small amount, while the Bloc would be wiped off the electoral map. From that perspective, FeD might have the potential to be symbolically most dangerous to the Bloc at a low level of support like 5%. But what if we up FeD's score slightly, to 7.5%? At that level, I would suspect Fortin might have a chance at re-election. And with just 2.5 more points' worth of support, FeD really starts to become a problem. Now we see how FeD is, in the end, a party that could hurt the NDP the most. The New Democrats, dropping to 23.6%, lose 17 seats and fall to just 29 province-wide. The Liberals take advantage of the split among francophones to win 34 seats, 11 more than they would be projected to win now. Even the Bloc, still with just 17.1% of the vote, makes gains. By comparison, a slightly stronger FeD has not much of a greater impact on the other parties. The Conservatives would be shutout in the province, but that is to be expected at just 5.9% of the vote. The Liberals drop just four seats despite a slide of 7.5 points. The Bloc, of course, again gets a goose-egg with even less of the vote than before. The NDP is the party that has to take most note of FeD. The Bloc is already polling so low that it is unlikely more blood can be drawn from that stone - there are sovereigntist voters in Quebec who will only ever vote for a sovereigntist party, and that may be the base the Bloc now finds itself at. The Conservatives could lose a few votes, but there is a world of difference between a protest party doomed to the opposition benches like FeD and a party of power like the Conservatives. The Liberals are probably furthest away from the FeD, also being a party of power but one that is perhaps even less inclined to give local MPs in Quebec free reign than either the Conservatives (who need their Quebec MPs to show a little autonomy from an unpopular government) or the NDP (who need their MPs to be good constituent representatives, if only to gain some incumbency advantages that they sorely lack). As the New Democrats made their breakthrough in Quebec primarily at the expense of the Bloc Québécois, it makes Forces et Démocratie a competitor for those votes. They are fishing in the same pond, with the NDP having an edge on those former Bloc voters who were more social democratic than nationalist, and FeD having the edge among those who were more nationalist than social democratic. But that assumes that Fortin can manage to attract voters in the first place. He lacks the charisma of former titans of Quebec federal politics like Gilles Duceppe or Jack Layton, and is likely to pale in comparison to the charm of Justin Trudeau and the confidence of Thomas Mulcair on the campaign trail. Fortin will not have an easy time of it, and the scenarios listed above of 5% or 7.5% of the vote may be on the optimistic side. But this exercise does show the kind of role Fortin's FeD could play in the next election and why the NDP, more than any other party, needs to ensure it never gets off the ground.